Home > Men's Vintage Shirts > All Men's Vintage Shirts > (L) Vintage 1980s "COSBY" sweater. Purple, White, Black, Emerald, Heathered Gray! 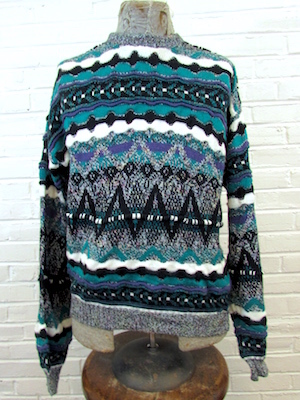 Vintage 1980s "COSBY" sweater! Classic 80's style sweater with bar patterns in white, purple, emerald and black with a heathered gray made up of all of the other colors in the sweater! Funky zig zagging pattern and bubbling line pattern through out the striping. Neck, ribbed cuffs and hem are done in the heathered gray. Made by Concrete. 100% acrylic. Design is front, sleeves, and back.